Today, while some may be out filling their bags with candy and goodies, we will be out gathering a bit more of that last late harvest. Last night we got our first real hard frost. We did cover everything, but it’s time….time to bring most of what’s left inside for winter storage. 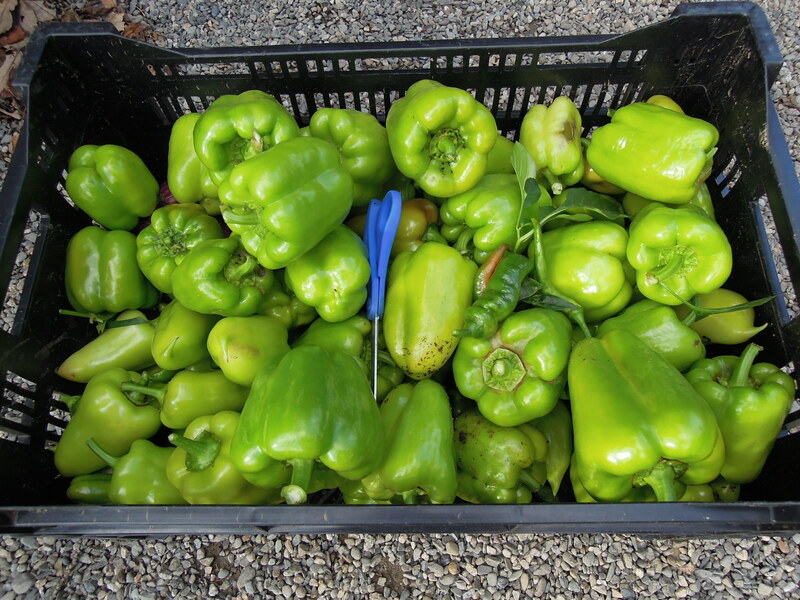 The pile of peppers were collected from the hoop house and larger cold frames. 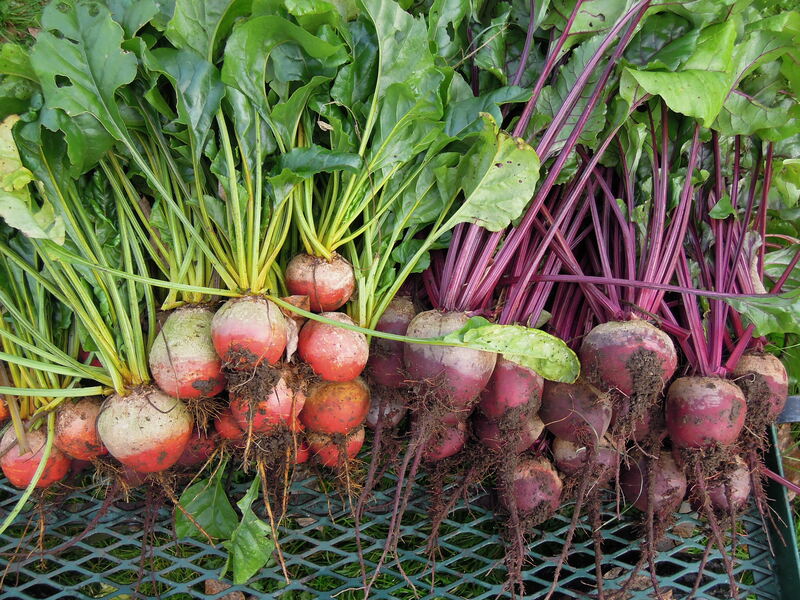 The beets have been growing in the main garden and doing well to tolerate light frosts, now they’ll come in. The winter squash that has been curing in the greenhouse will be put into wooden boxes and stored upstairs in our coolest room ( actually about 50 degrees and dry, which squash prefer). I think our final squash count was around 100. A collection of butternut, buttercup, delicata, and some smaller blue hubbard. Last to come in will be the cabbage, the kale and chard, and some last rows of spinach. On Monday, the larger flock of sheep will come home to their winter quarters. Having things ( animals and vegetables) tucked in and close to the homestead during the winter months make tending to chores much easier. After all the work today……a trick or treat candy bar would be nice! Formerly known as Cimicifuga simplex ‘White Pearl’, this wonderful woodlander is now in full bloom, the 30th of October. The Cimicifugas have gone through a few name changes that are sometimes confusing to the gardener. The whole genus of Cimicifuga has been moved into the genus Actea along with ‘Dolls Eyes’ and the like, and the species A. ramosa is now A.simplex, and the latest blooming of them all is Actea matsumurea ‘White Pearl’. A native of Russia, this is a cultivar selected in Japan. It grows to 3-4′ in moist soil that does not dry out, taking a few years to grow into a large multistemmed plant. 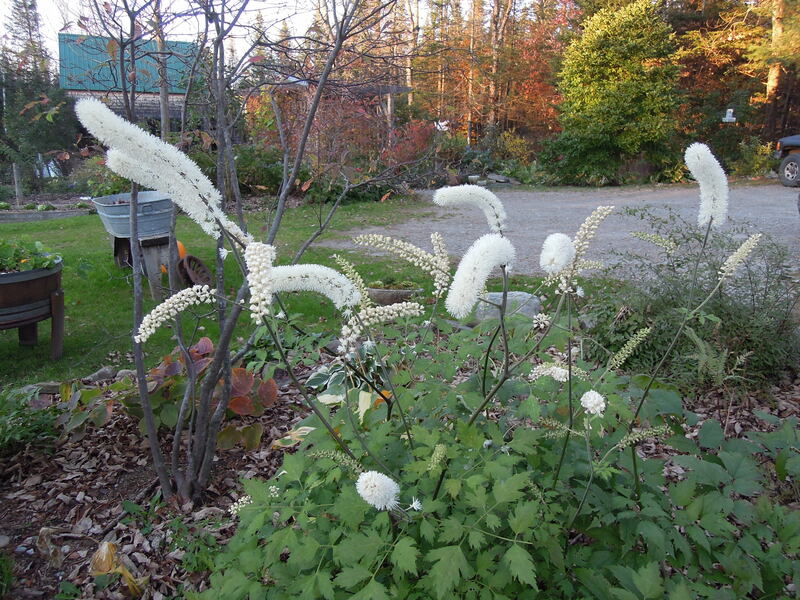 The white fragrant flowers can go into November if we do not get a real hard frost by then. Having the blooms mixed in with the fall foliage of other plants can be quite stunning. 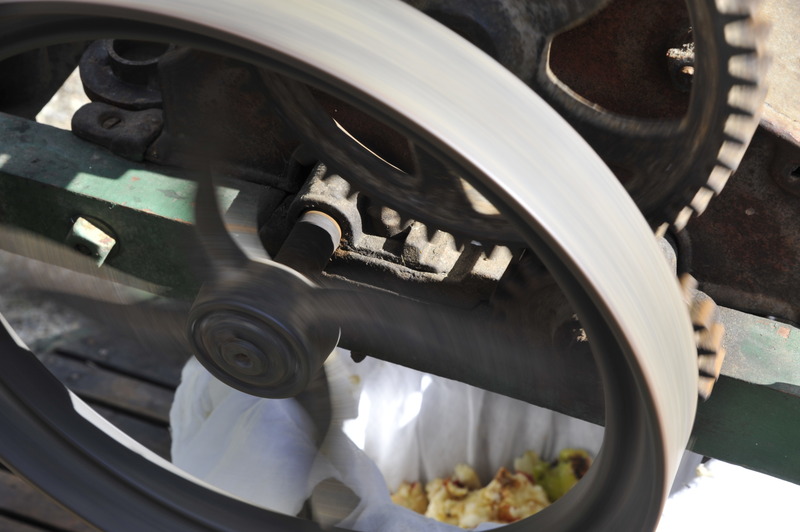 Cimicifuga means to’drive away’. 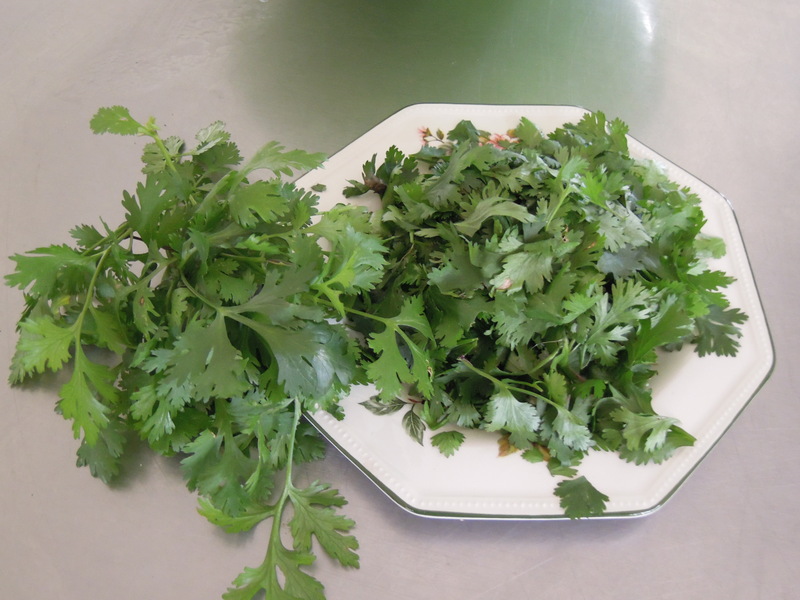 the leaves have a natural insecticidal effect and are not bothered by most bugs. One thing we have done is to plant several species of the green leaved Cimicifugas(yes we will continue to call them Cimicifugas) together for a season long bloom in that spot of the garden. C. racemosa will bloom first, followed by C. simplex and then C. matsumurea. Since all of them have very similar leaves, it just appears that the blooms are from the same plant. As with all of the species and cultivars of Cimicifuga, this one deserves a place in the garden. 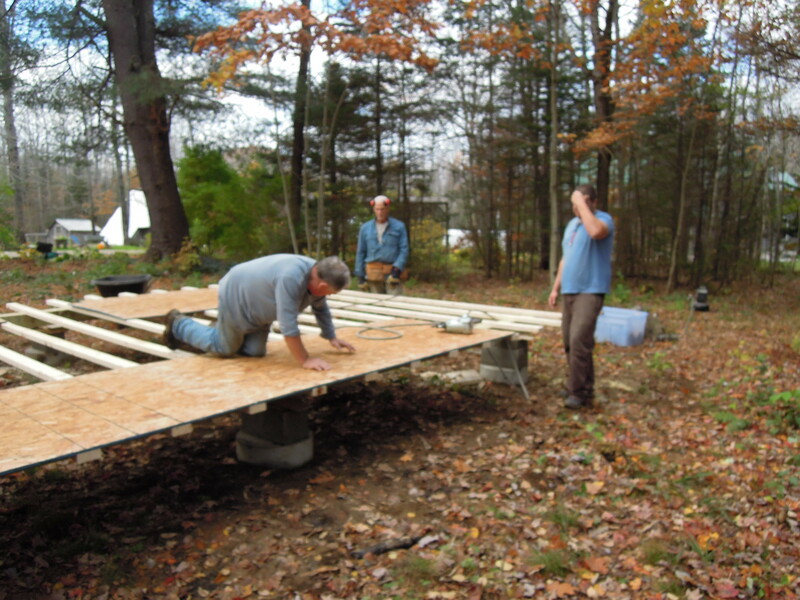 The studio that has been on our list to build is underway and will be completed and ready for late winter/ early spring classes. Over the last several years we have been offering classes here at the nursery and farm. Rick has taught many classes on native plants, plant propagation, and designing beds for shade. We’ve had workshops on building hypertufa vessels, dyeing and spinning wool, and soap making. We’ve taught people how to butcher their own chickens and cure and smoke bacon. Now we are wishing to expand the classes and workshops we offer. 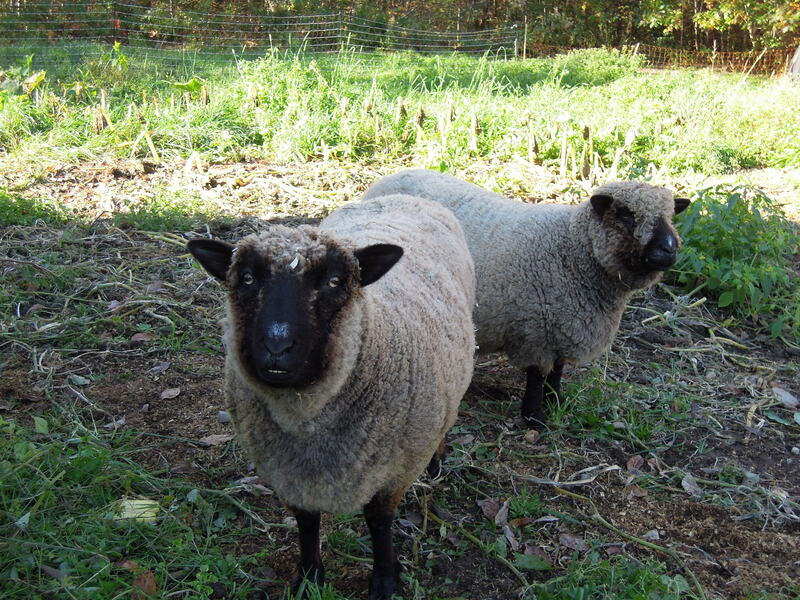 More classes on raising sheep, washing and dyeing wool, and spinning and felting. A workshop on fermentation, home canning, and sausage making, may be what’s offered. Imagine wanting to learn about homesteading skills, and knowing of a place to learn them. In addition, Rick will increase the amount of workshops being led on horticultural topics. A native plant walk and idtentification class. A talk on shade and woodland plants for the garden. A hands-on work shop on plant dividing. Just to name a few. We think the nursery and farm here are unique in many ways. The nursery is unusual with regards to the native and woodland plants ( shade and some sun loving plants, as well) we grow . Rick has been working with natives and woodland plants for well over thirty years. His knowledge and experience has always been a welcome help to customers who have questions or for those who want to learn the most they can about native and woodland plants. We have always been a rare find amongst plant enthusiasts. Though we actually have about 15 acres of land, we grow a tremendous amount of food on what would be considerd a small holding. We can see all of our gardens from the house. In addition we raise at least two pigs a year, 75-100 meat birds ( chickens ), lamb, and raise a substantial laying flock. Our three large organic gardens easily produce enough food for two to three families. We operate a greenhouse, a hoop house for an extended growing season, and several cold frames. What we buy for food is kept at a minimum on account of what we are able to raise and preserve. We feel that we are a good model for living sustainably on a somewhat small piece of land. Not everyone wants to own large 100 acre parcels of land, and knowing that you can provide for yourself on far less, can be helpful information. Also, we are firm believers that growing even a little bit of food on your own decreases your dependency on others to do it for you. We see our life here as a cycle of activity that allows us to be as self sufficient as possible. So, in order to accomplish this, we pay close attention to how we’re doing things. We are good soil stewards. We rotate crops. We pay attention to pollinators and how to avoid plant disease using organic methods. We keep our overhead low and try to always be efficient in our work. These are the types of skills we’d like to share. The new studio will be a place to offer more workshops and classes on all that we do here, from native plants to growing your own food, to learning about soil amendment or making your own soap. We’ll be keeping you posted on the progress and would love to hear any suggestions about classes folks might be interested in ( Sharon, if you’re reading , I have your ‘what to do with herbs’ class on the list). If you are interested in plants, take advantage of the knowledge and experience Rick has to offer, and suggest a class. By spring we will have a list of what’s being offered so far, so keep checking in. In the meantime, we’ll keep writing about life here at Fernwood. A few knitting projects are on needles right now. Christmas stockings being one of them. The pattern is from Judy’s Colors, a Maine based company ( one woman!) who sells these Christmas stocking patterns and kits. Check her out. 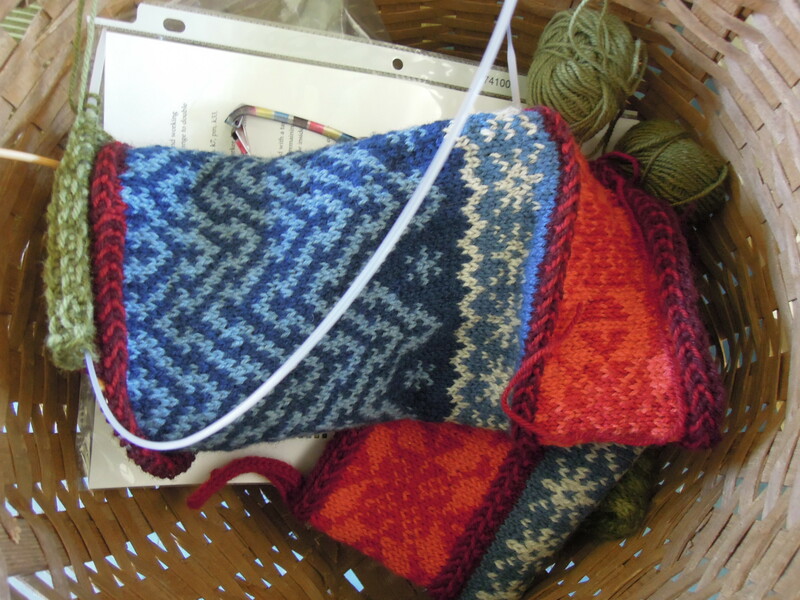 I usually have several different ‘types’ of knitting going at one time. By this I mean, some are suitable for knitting without needing much concentration, and other projects require me to really focus on pattern stitches. 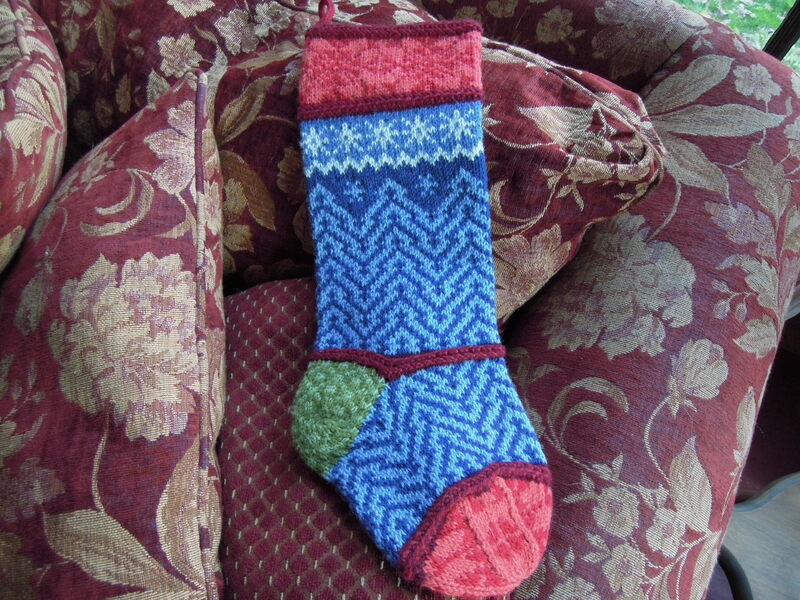 Like these Christmas stockings, which I love, but only knit when I can sit without distractions. This can easily mean that it may take a very long time to complete one………distractions can be a BIG part of my everyday. Once again our weekly knitting group will gather this Sunday. We slack off in the summer, everyone too busy farming and gardening, but we all look forward to Fall when we meet Sunday afternoons to share any projects we’re each working on, drink tea, and chatter about what’s going on in each other’s lives. I look forward to this time that we set aside to come together and knit ( or crochet, or sew, or hook a rug), though I probably won’t be working on my Christmas stocking that day, the chatter and laughter that often fills the room is sure to result in dropped stitches or skipped rows. These are our favorite veggie burgers. Believe it or not, everyone in our household loves them. The thing about veggie burgers, is that right off the bat, you shouldn’t compare them to the standard meat burger. A big juicy cheeseburger with all the fixings will probably trump a veggie burger anyday. They’re two different beasts altogether, as my friend Elmin would say when comparing two very different things. So let veggie burgers stand on their own and let them be what they are……some assembly of beans, rice, or oats, with all kinds of other things mixed in. A yummy concoction that shouldn’t have to sidle up to anything else and be compared. I’ll tell you what we put in ours. Personally, I think it’s the ample amount of freshly chopped cilantro, garlic, and walnuts that tip them over to being our favorite veggie burger….. along with the lime dressing we drizzle over them just before we eat them. Also, these freeze really well, and they’re flat enough to fit in our bulging freezer. That’s a plus. mix all these together while still warm. Once I have pulsed these ingredients, I add the bean/bulgar mixture and pulse again. 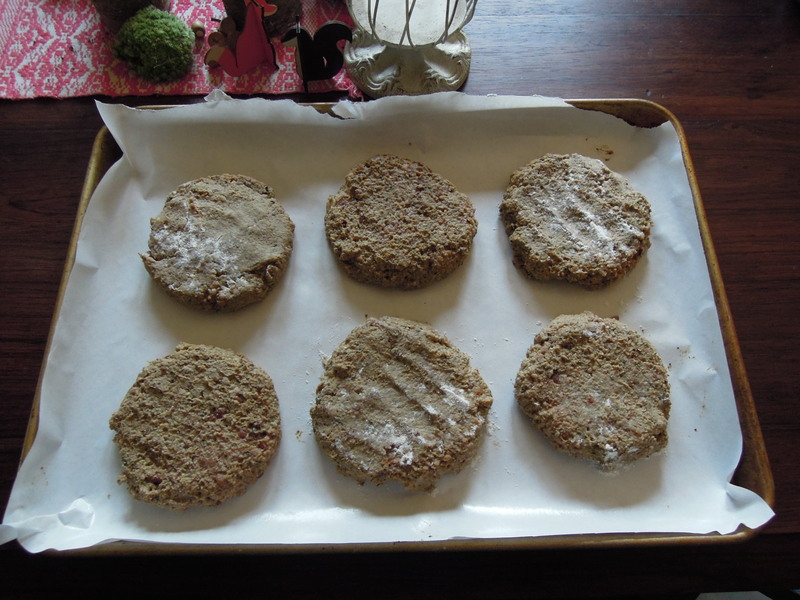 Then form patties and place on a parchment lined cookie sheet. Chill or freeze. I sometimes dredge them in a bit of flour if they are ever on the wet side. When cooking these patties, brush them with a bit of olive oil and cook on a medium heat, turning at least once. With homemade rolls and topped with some lettuce and a slice of tomato, they’re pretty delicious. Enjoy! 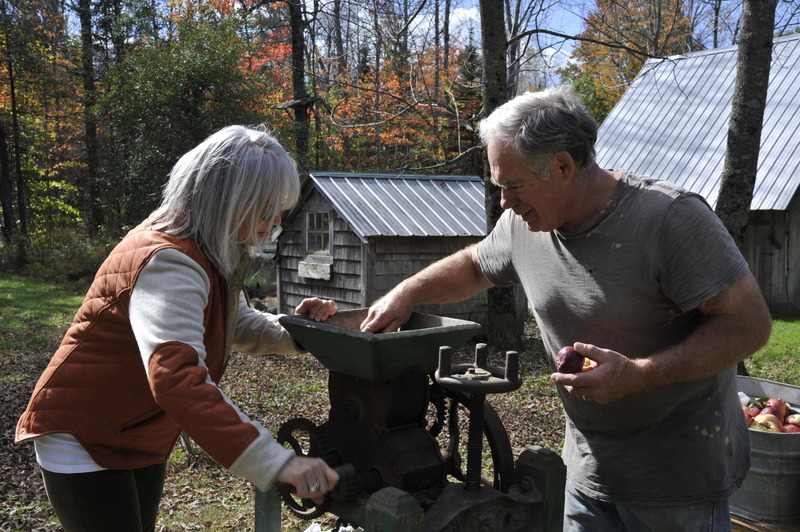 Every year we get out our old apple press and make enough cider to enjoy during the winter. Of course, a couple of gallons are set aside for Thanksgiving and a few more for the making of some hard cider. You betcha! We gather apples from some of the old trees around town and our good friend Moe brings us a bunch from his orchard. 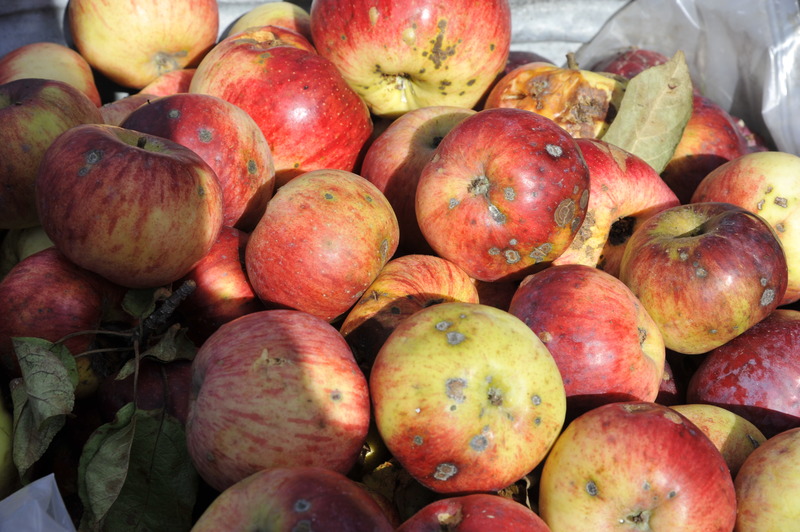 The different varieties make a tasty brew and we have come to know which apples make the sweetest cider. It is not uncommon for us press a batch of apples and pears together. One year we threw some ripe grapes in the hopper along with the apples. All of this means a lot of taste testing. So terrible, huh? 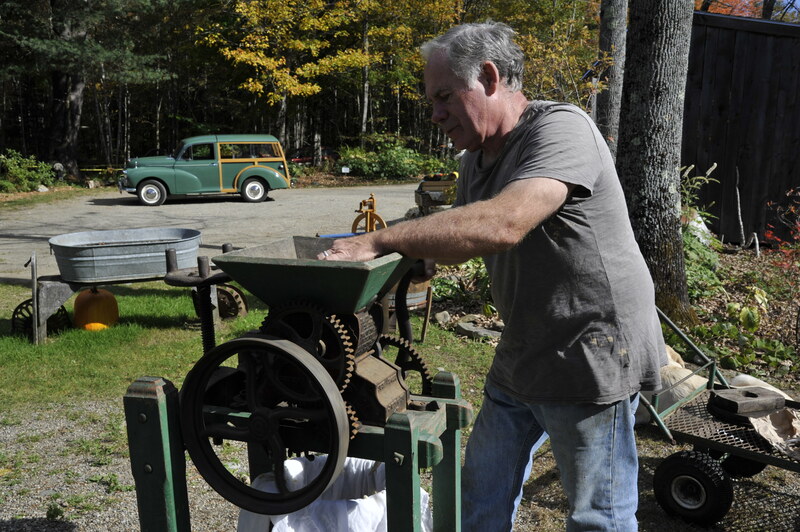 I am always amazed with the ability of our old apple press to keep grinding and pressing wonderful cider. 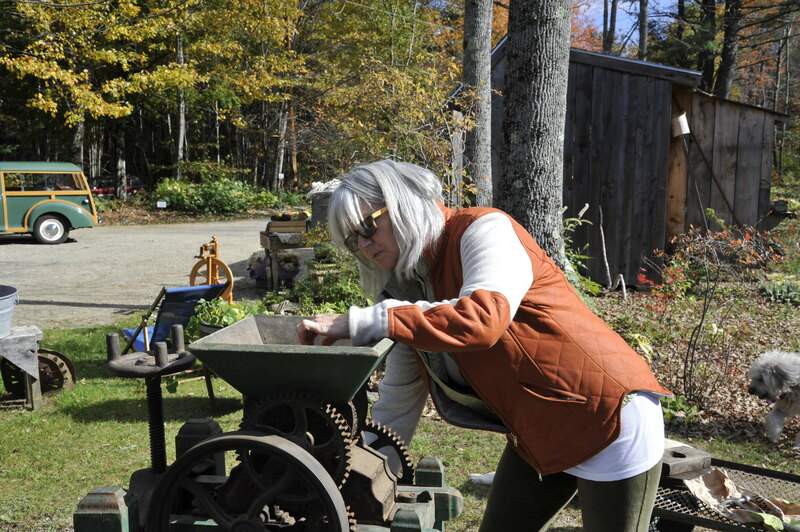 This cider press was made in the 1800’s and still cranks out cider just like it did in its earlier days. Some things just don’t need to change, they don’t need to be upgraded or overhauled, and they certainly don’t need to be replaced by some modern version ( that will probably need replacement parts within the first year). 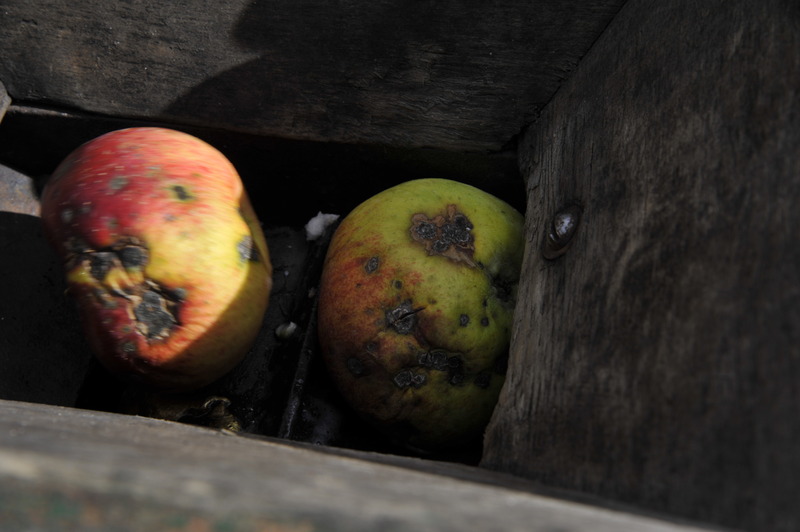 We’ll stick with this old gal……which not only presses great cider but is beautiful to look at. Cider freezes really well, as long as you leave plenty of space in the jug for the liquid to expand. Our issue is finding room in the freezer. Several gallons will have to be stored in some friends deep freeze until some space frees up in ours. Or….we can just make a whole lot more hard cider! Our good friend Sally helped with cider making! 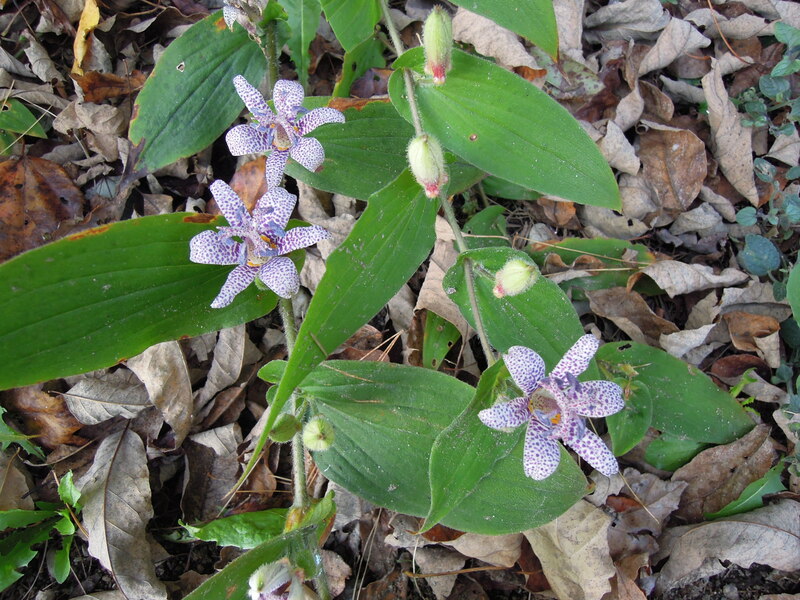 Tricyrtis, commonly called toad lily, is a late blooming perennial for the shade garden. We have them in bloom now in our gardens. There are about 20 species of Tricyrtis, mostly from East Asia, where they inhabit wooded edges and shaded areas where the soil is rich and evenly moist to wet. Most of them bloom from August through September, but some will bloom even later as hard frost will allow. One species, Tricyrtis latifolia, does bloom in mid summer with yellow flowers. The flowers are very orchid like, usually having a base color of white to cream with many blue, purple, or reddish dots on them. Depending on the species or cultivar, the flowers are held at the tip of the stalk or at each leaf node, giving the plant an arching effect as they open and weigh the plant down. With more than 30 cultivars to choose from, hardy from zone 4 to 7, one can usually find a few for the garden. They are not a favorite of deer. We have had very good success with them and are always pleased to have them in adding such interesting color so late in the season. 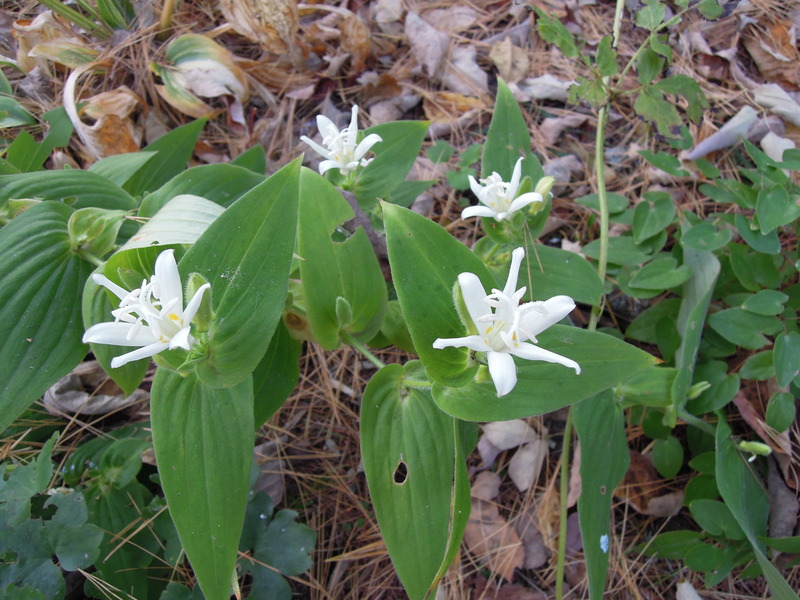 And how did the Toad Lily get its name? On the back side of the flower there are small bumps that resemble warts, much like the warty skin on a toads back. Fernwood will be participating in the Belfast Creative Coalition Cultivate: Arts and Farm Tour this weekend ( both Saturday and Sunday, October 11th and 12th from 10:00- 4:00). Rick will be giving a native plant talk on both days at 1:00 p.m. 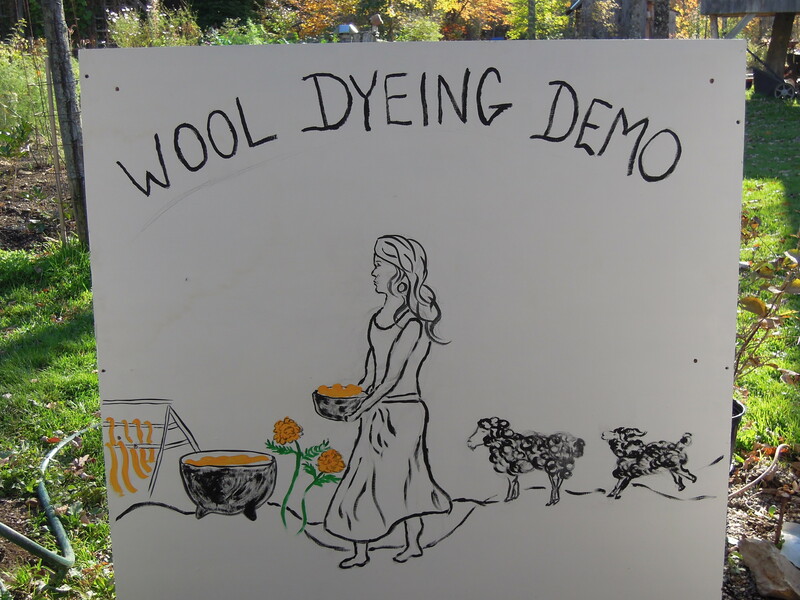 I will be providing a wool dyeing demo ( also on both days) at 11:00 a.m. 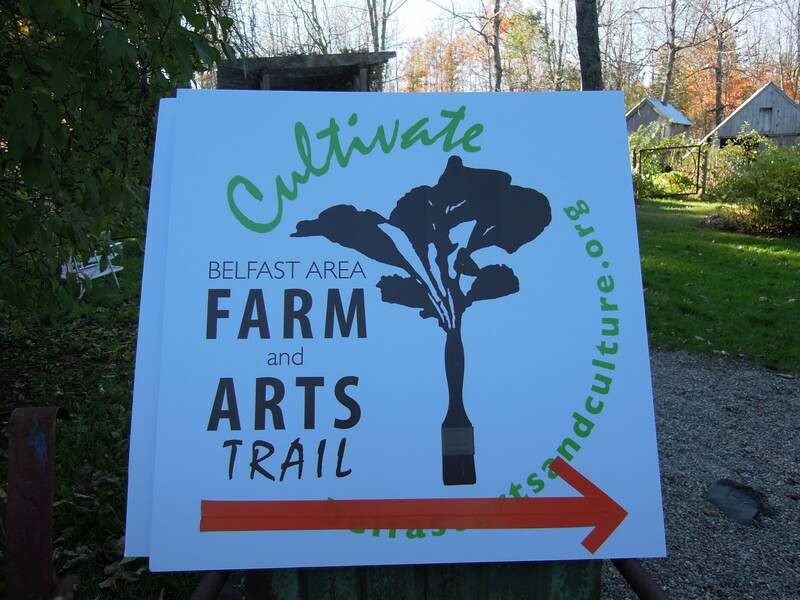 The tour is free, and for folks wanting to get out on a beautiful fall weekend to explore some local farms and art, check out this site for more information and a tour map ( Belfast Creative Coalition). We’ll be here at the nursery talking plants, gardening, wool, and sustainability. 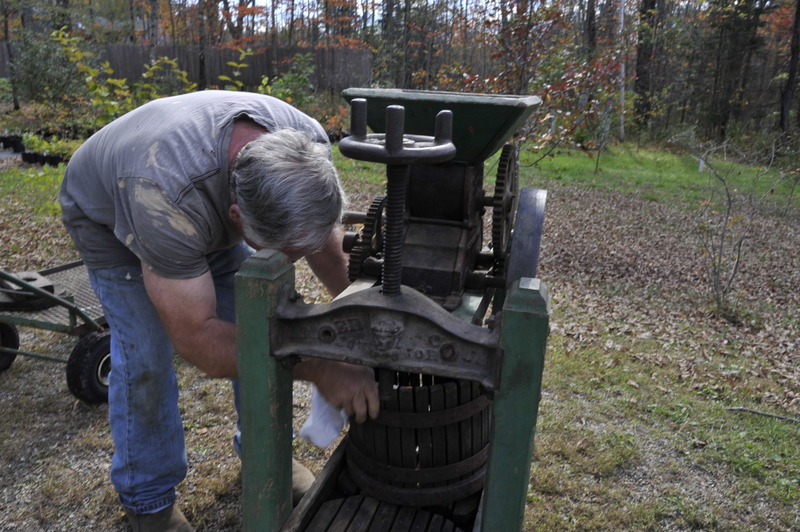 We’ll also be pressing apples throughout the day using our 1800’s cider press . If you plan a visit to Fernwood today, you are apt to see lots of what happens here in the fall. Garden beds being turned over and amended, seeds being harvested, leaves raked and spread into the gardens, garlic being planted. Come ask some questions and see for yourselves what chores take place this time of year at Fernwood. The weather should be great and perfect for getting out to explore all that Waldo County has to offer. Come join us! 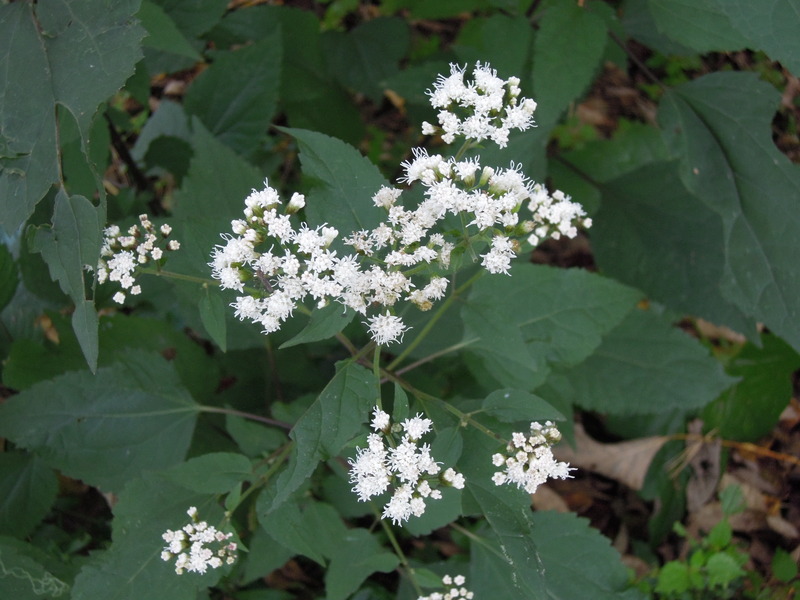 Eupatorium rugosum, also known as Ageratina altissima, is an herbacious perennial native to most of the eastern U.S. A selection of the species made by the Mt Cuba Center, ‘Chocolate’ grows to about 3′ and has purple leaves and dark stems. 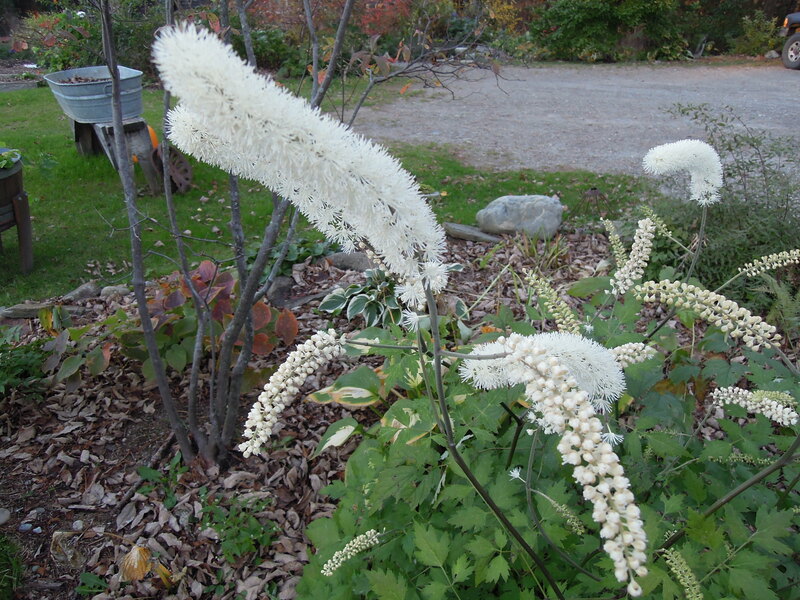 For us, it blooms from late September into October, with corymbs of very white flowers up to 5″ across, a very welcome sight this time of year. It will grow in sun to part shade in average to moist soils. Plants grown in the shade are more tolerant of dry conditions. It can be slow to get up and growing in the spring, but will soon reach its stride and fill out. If grown under ideal conditions it has been known to seed out. Its common name, ‘snakeroot’, refers to how it was used by Native Americans as a poultice for snakebite. It was also used as a treatment for painful urination, diarrhea, and kidney stones. But caution should be used as all fresh parts of the plant are poisonous and even fatal if ingested due to the chemical Tremetone. This is such an easy care plant with great foliage through the season, and we so look forward to its blooms in October.